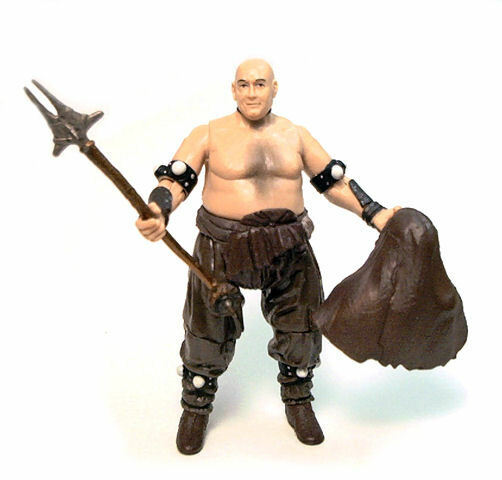 Hasbro released Malakili in 2009 as part of the fourth wave of red-carded Legacy Collection figures, a wave inspired in the characters from the Episode VI: Return of the Jedi movie. 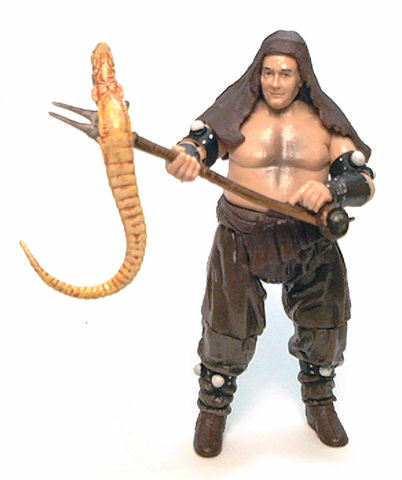 Malakili is a character whose claim to fame comes from being heartbroken when Luke Skywalker kills the Rancor at Jabba’s Palace by squashing the creature with a spiked door. The next scene shows Malakili sobbing inconsolably as another of his co-workers leads him away from the Rancor’s den. So, What else can be said about this character? 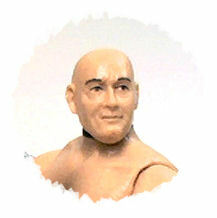 Visually he is a middle aged bald, fat man who wears puffy pants and a leather sack over his head. Not precisely exciting, but seemingly that’s enough to spawn three different action figures over the years. This latest version has a much more detailed sculpt and a higher articulation count, which in my book makes it the definitive version for this character. 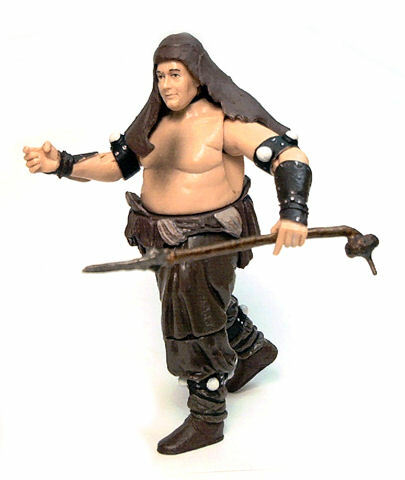 The upper torso seems correctly sculpted, complete with flabby folds on arms and torso, and the puffy pants have deep creases and folds that hide very well the articulation. The attire is completed with leather bracers and bands around biceps and calves (which seem to have ping pong balls embedded in them). 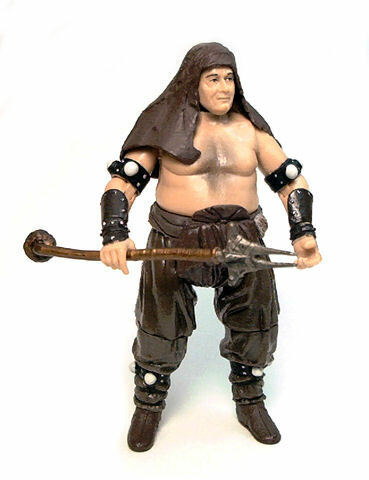 The hip piece is covered in what appears to be a non-removable big brown rubbery diaper that simulates a loincloth, which I guess would facilitate parts reuse when and if Hasbro decides to make another rotund character. 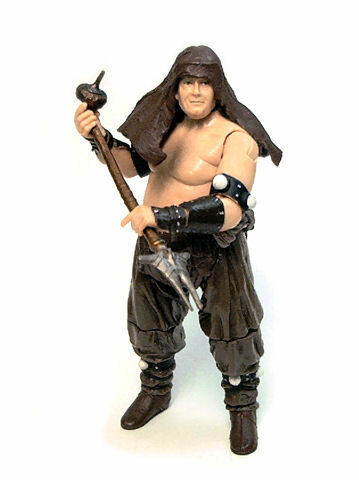 Malakili has very little paint applications going on, other than a slight dark brown wash on the pants and boots; the bracers and leather bands are painted in a darker tone of brown, with small silver rivets on them. The larger spheres on the bands are simply painted in white, hence the ping pong ball analogy. There are a couple patches of a lighter brown/grey on the sash area. The upper torso has a dark airbrushed patch on the chest that reasonably simulates hair, and the paint on the face is very neat and well applied. Speaking of faces, Malakili has a rather jovial demeanor, and even resembles actor Paul Brooke a little bit. Offhand, I’d say it would make for a pretty decent Marcus Brody custom. Ball jointed neck. Excellent motion range without the cowl on. With the cowl on the number of poses decrease. Peg & hinge shoulders. Excellent motion range, but raising the arms too high will make the cowl pop out of place. Peg & hinge elbows. Very good 90° bend and 180° sideways rotation. Swivel wrists. Free 360° rotation. Swivel hips. These are rather limited in scope, mostly due to the rubber diaper piece, but walking and running poses are possible. Peg & hinge knees. Very good bending range and sideways swiveling. .
Peg & hinge ankles. Not a lot of forward bending but good back extension range, free 360° swiveling. Malakili comes equipped with a removable cowl and a gaffi stick. While the cowl seems to be unpainted, the gaffi has a nice coppery/brassy paint application on the shaft and a flat gunmetal gray applied to the pointy double axe-head. The removable cowl turned out to be the only really annoying aspect on this figure, because it tends to pop out almost every time the arms are raised or the head turned. Like the rest of the figures released within the Legacy Collection, Malakili ships with a Build-A-Droid Piece, in this case the left leg for the R5-C7 astromech. Overall, Malakili turned out to be a rather fun figure to have. Joints are solid, paint is clean, and the costume design fits well in a variety of settings and toy lines, so it has very good custom/kitbash potential.